I first met Stephanie (Steve) Shirley in 1963, when our same-age babies were tiny. We had a pleasant chat about what intellectually stimulating work programming was. 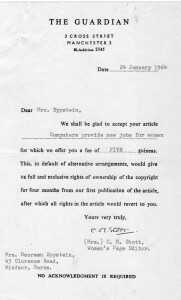 Frustrated with the sexism that prevailed in the world of employment, Steve had left her job with Computer Developments, Ltd., to start her own company, Freelance Programmers. Her workload was growing as new clients learned of her services, and she was starting to reach out to other former programmers for help. … My article was published in the Guardian, and since then I have had a flood of letters. Mainly for forwarding to the woman mentioned in it, a computer programmer, retired with a baby the same age as ours, who is trying to get other women like herself to join her in working on a free lance basis. In January of this year Mrs Steve Shirley was working quietly at home making up computer programmes in between caring for her baby and doing her housework. Now she has found herself the head of a company employing upward of twenty retired, home-bound programmers like herself. Like many businesses, it started in a very small way. When she retired from her job as a programmer with a big computer company, she was offered a few programming projects to keep her occupied at home. She could work at them in a leisurely fashion, enjoying the contrast between the stark, modern, technical world of computers and the idyllic charm of her cottage in the Chilterns. In this way she found a mental satisfaction that had not been fully achieved in caring for her home and family. As her circle of clients widened, she was considering seeking out other retired programmers like herself who could help with the load of work. 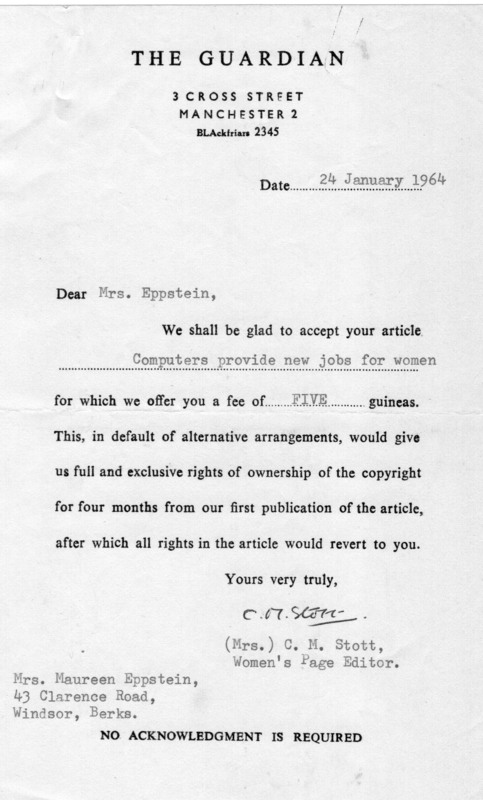 Then a Guardian article on programming as a career for women [my first article] brought in a flood of letters from women who were desperately needing something more stimulating to do with their time. Many were very highly qualified, but because of their children could not consider going back to a job that wanted them on an all-or-nothing basis. There are some obvious difficulties in running a part-time business of this kind, and Freelance Programmers Ltd. is now having to face some of them. The first is one of organisation. To get a reasonable standard of efficiency, Mrs Shirley had to eliminate those applicants who did not have access to a telephone. The business is at present being run from the cottage, where the telephone rings at all hours of the day and night, and Mrs Shirley herself works very long hours keeping in touch with her staff. In order to get back herself to the part-time basis which would give her time for her family, she plans to open a central office. Here she would be able to employ a typist—at present she does the typing herself, or sends it out to one of her staff, thus making a two-day time lag. The office will be in an area where some of the staff are already living, and her plans are for a combined office and nursery suite, so that the mothers who come to the office will have the children cared for, but will be at hand if needed. There will still be many of the staff working by themselves at home. Some of them are doing it because they need the money, but for the great majority it is a release from the pressure of four walls and a roof and a tedious round of housework. Mrs Shirley has proved that this method can be made to work, particularly for fairly short-term projects. A larger job, that might take perhaps two years to complete, she prefers to give to women less tied to family responsibilities. She also needs more free women for the large amount of travelling and meeting clients involved in the business. An ideal staff member is a woman with no children, who is married to a schoolteacher. She had been unable to get a normal job because she wanted all the school holidays off to be with her husband, and not just the regulation three weeks. But for several months at a stretch she is free to go anywhere, do anything for the company. It has become clear that an entirely homebound, part-time organisation will not work satisfactorily. But a group that is basically of this sort, with a leavening of more mobile staff and with an efficient central organisation, may well be a model on which similar groups of professionally trained women might be based.